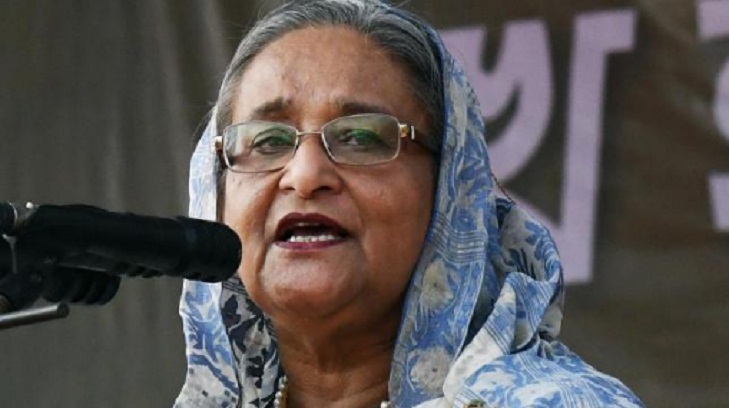 Prime Minister Sheikh Hasina on Tuesday said she never tried to retreat from doing welfare of the country and its people even after repeated death threats in her life. "I’ve to move with the pain of losing close relatives. The path is not easy. I know I may have to face death again …I never tried to step back," she said. The Prime Minister was inaugurating 23 bridges on Joydebpur-Chandra-Tangail-Elenga road (N-4) under South Asia Sub-regional Economic Cooperation (SASEC) and Fatehpur railway overpass in Feni on Dhaka-Chattagram highway through videoconferencing from her official residence Ganobhaban, reports UNB. She said although Bangladesh earned the independence under the leadership of Father of the Nation Bangabandhu Sheikh Mujibur Rahman, the defeated forces never sat idle. "When they saw that Bangladesh was advancing economically, they made the strike on August 15, 1975 with their all strength." Sheikh Hasina, the eldest child of the Father of the Nation, said they did not kill only the country’s President, but also ruined a family completely. “Ten-year-old Russel had not also been spared. Their motive was to make sure no one of that bloodline comes (leadership) and that country’s people do not turn around again surrounding him," she said. The Prime Minister said after passing six years in exile, she returned home in 1981 and since then, she has a single aim which is to uplift the nation for which her father had sacrificed his life. "I’ve to change people’s fate anyhow so that they can live in peace, happiness and economic solvency." Sheikh Hasina said the government is taking necessary steps for the development of the country and its people. "And I’m getting cooperation from all." She also mentioned that the highways the government is constructing have two types of carriageways -- one for local people and the other for speedy vehicles. "We’re constructing the highways in this way to reduce road accidents and to ensure that local people continue their communication without any problem," she said.